tonight for one hour, from 8:30-9:30pm wherever you are, join the rest of the world in switching off your lights to represent a vote for planet earth. for more information, go to earthhour.org. What a load of cr@p. Candles are less eco-friendly than light bulbs! Really? How is collectively non-consuming energy —almost worldwide — (even just for an hour) not a big reduction in the worldwide power supply? Is the manufacturing a candle taking up a big carbon footprint? 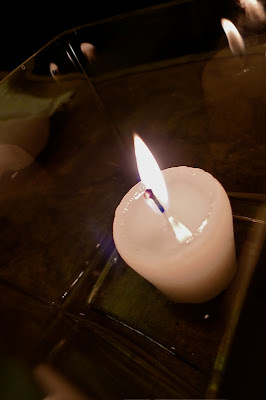 When a candle evaporates, is what is emitted an eco-hazard? The thing is, you're not supposed to even have your TV and computer on during Earth Hour, right? To know how valuable energy is, and how it's not easy to cope without it? earth hour is about turning off your lights only, but of course you're doing it better by not using any electricity at all. and earth hour is not really about saving electricity, it's about showing your support and marking a statement about saving planet earth. of course the real "earth hour" happens in our everyday lives, what we as individuals do to stop global warming (we may not see that in our lifetime, but hopefully future generations will).